The past few months have just flown by whilst we’ve been busy working in the background. 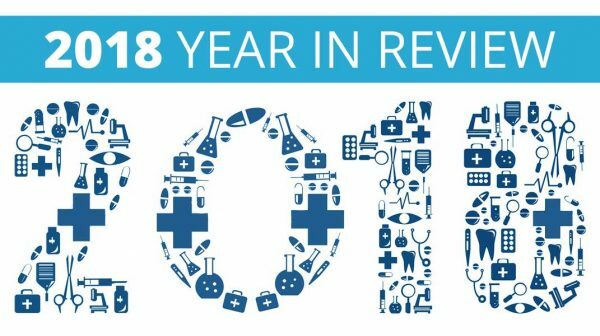 In this news post we’ll reflect on what “Standard Plan” Pre-Op Health Questionnaire improvements we’ve made and what’s in the pipeline for the coming weeks. When planning our last development cycle, we listened and watched. We asked patients what they liked, loathed and loved about the site. 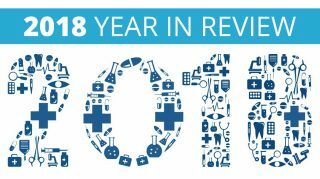 We spoke to many of our anaesthetists asking what they would like to change and we came up with a list of 127 improvements to be made (we truly LOVE feedback!). Everything from tiny question / word changes that confused patients (most have been done as I’ll discuss below), to special changes (if you are on the Standard plan you should be receiving today an email asking for your opinion of important ones) to big changes like planning to bring this site into web 3.0 style (coming soon…). As always we love hearing from you so feel free to contact us with your comments or call with your suggestions. 1. Save and Continue – This is probably the biggest (and most time consuming to implement) change. The most popular comment we received from patients was “It would be useful to be able to save a form and complete later”. We also had many comment that they wanted the ability to start the form on their mobile phone but then finish it on their computer where they could upload documents they had stored on their hard drive. 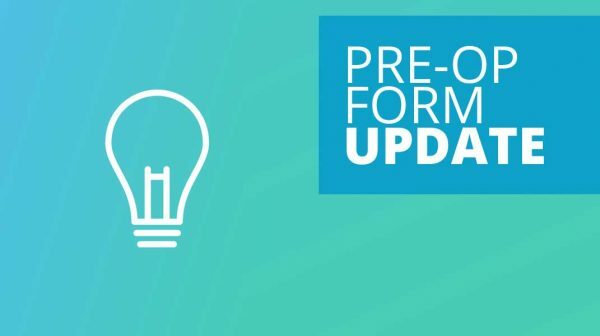 All this is now possible as the patient can choose to save the pre-op form and receive a secure link saving their entry allowing them to finish the form later. 2. 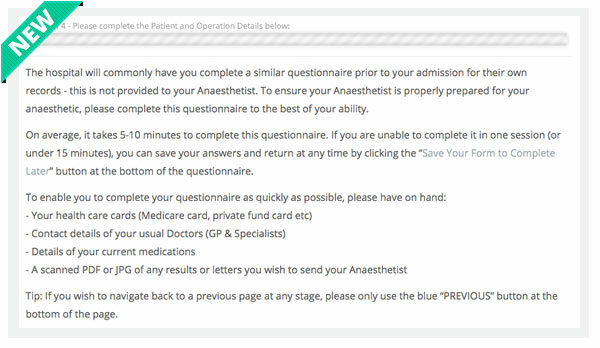 New Progress Bar – we had 3 patients complain to their anaesthetists they couldn’t ‘download’ the form and that it kept getting stuck. We couldn’t for the life of us understand what they were trying to download as it’s an online form.. then one day and a big ah-ha moment we worked out the progress bar at the top started at 25% (first page of four) which confused some patients. We have now reset this to 0% and a note saying “Step 1 of 4 – Please complete the Patient and Operation Details below”. 3. Rewording “Is this you?” – we heard from an anaesthetist that one patient wrote in this space “I’m not a robot”. Cute as it was we realised this question may confuse some patients so we re wrote it to “Are you the patient?”. If the visitor selects no it asks them their name and relationship to the patient etc. 4. Date Picker – this was just one of those super easy changes that we are surprised we didn’t think of earlier. 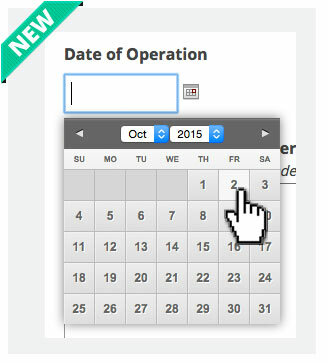 Now when the patient is selecting the date of their operation a calendar will pop up making it much easier. 5. Additional Teeth Option – under the teeth question a “Braces” option has been added. 6. Additional “Other” Payment Method – for those that want to write they have a special DVA card or would like to pay part direct deposit and part credit card. 7. Extra File Uploads – now it’s easier for patients to upload multiple files to the form. Each upload will still be sent to you as an attachment for easy opening. 8. Updated Weight and Height Fields – these fields are now text boxes. The only difference is previously being number boxes when patients entered “kg” or “cm” in the fields an error would show. Nobody likes an error message so text boxes seemed a friendlier option. 9. New Confirmation Email – once patients hit the pre-op health questionnaire submit button they are taken to a page clearly showing them the form has been submitted and sent to you. They now also receive an email saying their form has been sent to you. Just a minor change but something to make it very obvious their form has been successfully completed. 10. 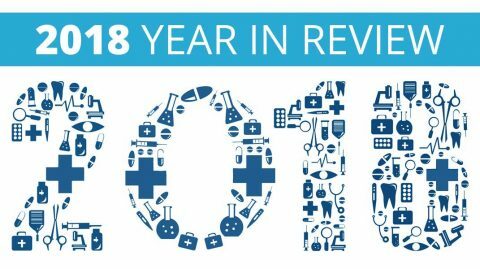 New Feedback Reporting – by now you are probably thinking how do we know all these patient recommendations and how did we come up with those 127 improvement ideas. Well we aren’t mind readers but we do now have a super simple feedback form that shows on the confirmation page after the patient sends you the questionnaire. 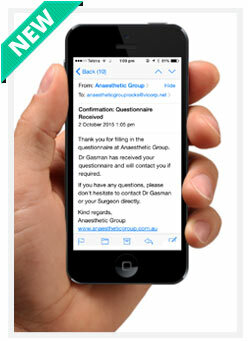 It’s a little note saying Anaesthetic Group was first started for an australian anaesthetist, that we would love to hear what they thought of the pre-op health questionnaire and asking if they had any feedback on how we could make it better. It’s completely optional but so far over 2,721 patients have filled it in saying what they thought (FYI 98.25% have said they liked the form happy dance!). We also get some of our best feedback here and many that make us laugh – like a Perth anaesthetist’s patient that recommended they would like us more if we were to “Offer me free chocolate“. But then I guess who doesn’t want free chocolate?!? 11. 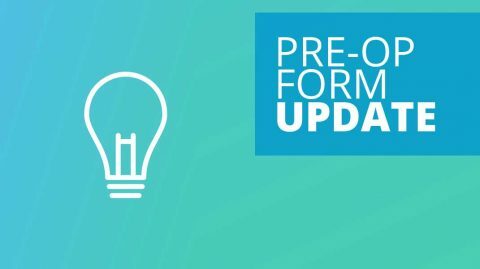 Form Preparation Guide – they say 41% of people get anxiety when they fear lack of preparation. After a few comments about this from patients (and being one of those people myself) I thought it necessary to clearly spell out to patients what they need to complete the form. The top of the pre-op health questionnaire now explains what information they might like to have handy (whilst also explaining the save and continue feature mentioned above). 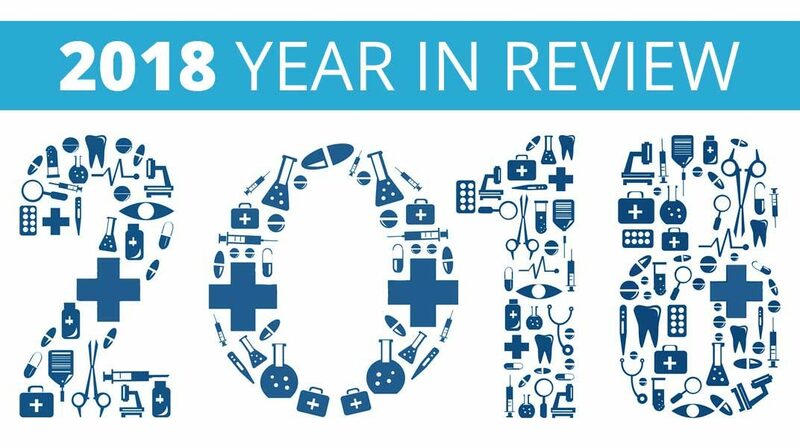 If you’d like to see a first hand example of all these improvements please visit our updated test Pre-Op Health Questionnaire / or simply go to your profile page and fill in your own questionnaire. 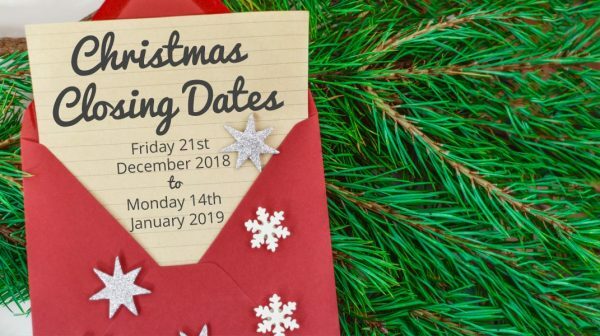 We have a lot of changes planned for the next few weeks and months. We also have a new developer on the Anaesthetic Group team – Nick. Nick brings with him some solid HTML, PHP, CSS skills and has already made some great suggestions to improving our code and making the site run better. Web 3.0 Styling – a redesign will probably be our biggest and boldest change to come. It will be subtle improvements at first all in the aim of making the site cleaner and clearer to use whilst also improving speed and user experience. New CRM – we are in the process of finishing off the set up of our new Customer Relationship Management program to ensure we can keep track of every little request, feedback and contact we have with you. This should improve the way we handle your history with us and make it easier for us to track your requested changes and feedback. Improved Analytics – this is something we’ll develop for our internal information. We always aim for website efficiency and speed and this will give us good numbers (non-identifying) on what features might be needed / not needed on the site also showing ways we might be able to help you and patients use the site and what information people are most looking for. Enhanced Security – as always we will consistently be implementing new security measures as they are available as security of information is our number one priority. We already have many systems in place to ensure your patient data is securely deleted once it’s sent to you. 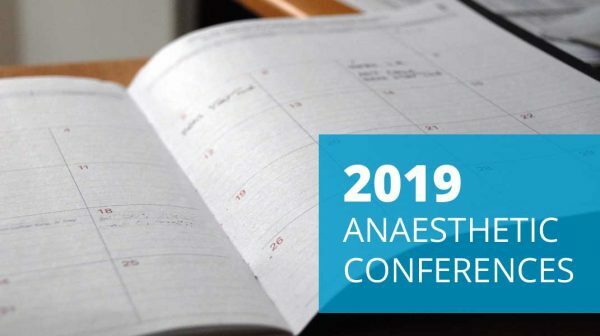 First Time User Guides – we’re putting together some guides to ensure joining Anaesthetic Group isn’t as daunting as it may seem. With so many different ways you can use the site, this will be very important for showing the new anaesthetists (and existing members if they’d like) the ropes and help them quickly master how to best use Anaaesthetic Group. If you have feedback on how we could have made your transition to Anaesthetic Group better or would like to receive this guide please let us know. How to / Helpful Posts – being married to an Anaesthetist there are a million posts I could write to you on everything from how to improve efficiency in your private practice to details of the next conference and where to stay / eat / shop and the best airfares to get there – as these are all things I spend hours researching anyway. If you’ve got any suggestions just let me know. And as I’ve also recently sold my manufacturing company yaye! my focus is now on making the Anaesthetic world a better place. This is what has and will be going on with Anaesthetic Group. 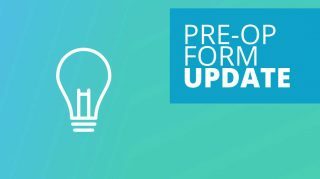 Don’t forget to check your email to see our pre-op health questionnaire changes we want to run past you before implementing them. We’ve got big plans so I hope you will be continuing to enjoy the journey and improvements we make. What about Premium Pre-Op Health Questionnaires? For Premium Plan members with customised forms, we can add this functionality to your forms too, if you like. Simply drop us a line, either by phone or email, and we’ll make these changes for you. … Our Premium Plan members can tweak their forms however they like, whenever they like. If there’s any functionality you’d like to see added to your forms, just get in touch. We’re always open to new ideas, so if there’s any suggestions or feedback you have for our pre-op health questionnaire or platform, please reach out and contact me.